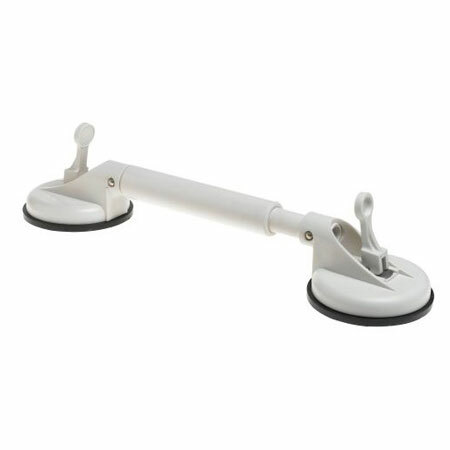 The Small Telescopic Suction Grab Bar fixes securely and easily to tiled and smooth wall surfaces to provide assistance accessing a shower or bath. A telescopic, extendable suction cup grab rail can be fixed to a smooth wall, ideally tiled, quickly and easily without the need for tools. It provides assistance when using the shower or getting into and out of the bath. This suction cup grab bar features large (4½") rubber cups which fix the bar to the wall very securely, and yet the grabrail can be installed and released easily using the stainless steel locking levers at each end, so can be used when travelling away from home. Please note that the product is designed to give support, but not to hold an individuals entire body weight. Use on a shower wall, in the bath, as a temporary towel rail, near a chair or the toilet. Delivery of this product will be made directly from our distributor in approximately 3-5 working days. The product is supplied with comprehensive user instructions.